NEVER Assume! Never Lose Faith! As an outfitter with more than 10-years experience guiding whitetail hunts, I’ve learned alot from my clients. We have had several clients that harvest world class whitetails most years they come to hunt. Its really amazing to book a 5-7 day hunt, months in advance, then show up and arrow a 150″ (or bigger) whitetail. But I have clients who do just that. Some every year, others every other year – some have opportunity (could have shot or shot and missed) EVERY year. They are amazing hunters and I would advise everyone to find out who they are, and hunt w them. Watch and learn – because what they do differently from most is almost imperceptible to most hunters. IF you can learn it, and IF you can mimic it, it will change your life in all of your pursuits. I was lucky – I saw the habit (which is what they do differently) when I was a kid. Though I did not make it a part of me until very recently. The first time I saw it I was hunting w Bill, the father of a close friend who rarely got to hunt. He was building a business of his own which took him far from the marshes of MD’s eastern shore in the mid 80’s – when the waterfowling was fantastic. It took alot of convincing and alot of promises along the lines of…”we’ll have our limit of ducks for sure my lunchtime”…My Dad and I had been hunting the Marsh for several days and seen great action on a variety of puddle ducks. Of course the more we “bragged”, the more I worried about the possibility of a slow day. But our story won his confidence and thus Bill and his son (my friend) joined my Dad and I on the hunt. By 9am each bird and group of birds we saw seemed to change direction as soon as they were in sight of the dekes. They had been doing exactly that since first light. By 10am, my feet were cold, I was sure we needed to move to a whole nuther part of the marsh if we were to have any hope at getting some shooting. So I made a plan to walk and kick up ducks – the wind was strong enough we’d have some hope of jump shooting birds and Dad, myself and Chris (Bills son) took a walk. Bill did not join us. He was just too happy to be out of the office, sitting in the marsh, drinking hot coffee, and the lack of birds meant he could relax and doze off. Something he NEVER got a chance to do. We heard the shooting start about 30 minutes into our walk. Although we never jumped any ducks close enough for a shot, Bill had shot his limit of birds in our stead. Not pass shooting either, the ducks were just pitching beautifully into the spread! Singles, doubles, even flocks. We returned to work the dogs on the downed birds. I was amazed. But that was really it for the day. I left very disappointed not having a chance to shoot like Bill shot at decoying birds…Oh well I thought…next time. Bill point of view was quite different! He had a great morning! It was well worth the day out of the office! That SAME lesson is in this photograph I love so much. But you will need some more background information to understand why. In the fall of 2012 EHD struck our operation and indeed huge parts of the midwest. Our area was crushed w an estimated 80-90% death rate for the whitetails. While some small areas were spared, our entire season of 2012 was spent seeing only yearlings from the stands. Older deer were no where to be seen, not by us, not by trailcams, and the skeletons in the ditches and waterholes told the story. By 2013 I had a big spine surgery which changed my life. I spent the first part of 2013 preparing for the surgery and the second part recovering to be strong enough, to check trailcams. Hunts were cancelled for the foreseeable future. My brother in law came out to hunt but spent his time down south on my dads property which only experienced about a 40-50% kill. Still some shooters were down there. In short, on the northern farms, we didn’t have a single trailcam pic of a shooter (not even during the summer). There was no reasonable expectation that a mature deer would be around, let alone one walking during legal shooting light within bow range of one of our best stands. I had told my brother in law to drive to dads each day for his hunt, told him its probably a waste of time for him to hang around the northern farms. He and my Dad were both visiting this week in December as they do most years the first week of December. Just like that duck hunt so many years ago, watching dozens of flocks turn away once they saw our spread – that feeling of hopelessness creeps into one’s mind and causes doubt, argument, and fear of failure concurrently with the belief that being elsewhere – almost anywhere, would likely offer better opportunities for your pursuit. That feeling builds inside you and becomes strong enough, I believe, for the rest of nature to sense the rising turmoil inside you. The reason, I believe Bill had such a great morning is threefold. First he stayed put. Second, he wasn’t there to kill ducks. He was there to enjoy being on the marsh, and thirdly three bored hunters, and I speak for myself because I was pissed it was so slow, (Maybe Dad and Chris were too) and left the area, and that aura of tension left the area with us and nature returned to normal. The spot was fine, the ducks wanted to be there, they just didn’t like the vibe. And, just like the photograph, despite all evidence to the contrary! A great shooter was there! Bowhunting is a solo sport. Had I been in the stand (next to this trailcam) this morning, at this time, knowing about the EHD and the unlikelihood of seeing a shooter, and having JUST moved here from the east coast, uprooting my life, I most certainly would have been tense. 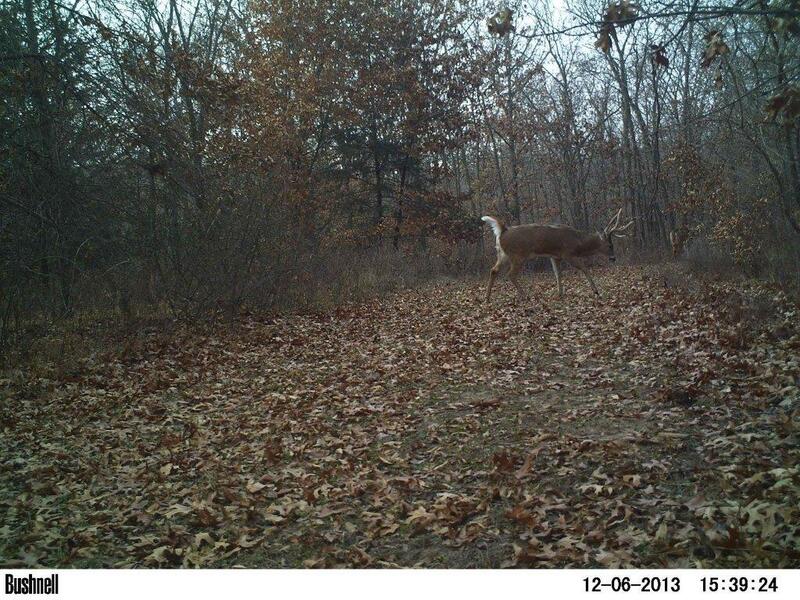 Maybe this buck would have sensed that and taken another route. But practicing the true enjoyment and connectivity that I get to witness from my most successful hunters, their only opinion is (can’t shoot em from the couch) and they love being in the woods. Nothing else enters into their minds. Achieving this state of mind isn’t easy. Its a true state of mind, not one you just think you are in. When your in it, time passes as if you are asleep, yet you are totally alert. This is how you know. When the deer you are after appears, or a similar great opportunity, you don’t feel shock, you feel (an unjustifiable “I knew it”), as if your confidence has just been mildly rewarded. This is the state of mind successful hunters have. This is the state of mind that keeps you in a stand the entire day and it feels no more stressful (mentally) than sleeping in a bed the entire night. This lesson isn’t learned and then known. This lesson is one that is always practiced. There are no experts at it, and I even imagine those that are best at it, hardly know they are doing it. It is a frame of mind I strive for at the beginning of every hunt. I find it helps to be in the stand an hour before first light, and enjoy the what goes on in the woods before light. Try to become a part of that. But maybe for you its different. IF you can find it, I can almost guarantee you opportunities come to you! Including giant bucks!